Last week was full of school spirit in honor of Winter Court with dress‐up days for even our youngest lions, the Winter Court presentation in upper school, and Friday’s pep rally. All festivities led up to the WA Lions basketball game on Friday, February 1, against John Carroll’s Golden Rams. The Lions entered the game with a 19–4 record, and as the last game of the regular season, they wanted to add one more win. The high‐scoring game proved this goal was attainable. The Lions’ won 78–50. However, the game was not the only crowning achievement celebrated on Friday. It seemed appropriate that on Senior Night, two seniors on the team celebrated milestones. Sam Griffin entered the 1000‐point club with over 1000 points for his WA career in just two short years. Chase Johnston set a new national high school boys’ record for all‐time career 3‐pointers with 523. 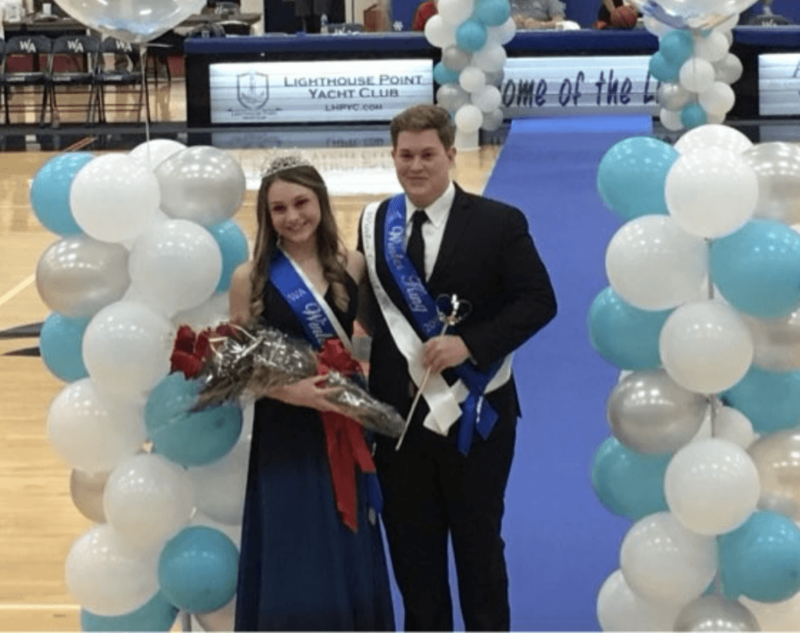 WA crowned seniors Tim Bibbee and Gabby Audet as the 2019 Winter Court King and Queen during the halftime presentation. Finally, competition continued after the Winter Court game when WA alumni faced WA faculty in the annual Lions Knockout Game. The Alumni took home the coveted Lion Knocker Trophy with a win of 80–75 in double overtime. This year, Winter Court week ended in the gym with dancing! The first‐ever Winter Court dance on Saturday turned the gym into a Winter Wonderland. The school‐sponsored dance not only allowed the students some fun, but also raised funds for SCORE International Ministries. WA Lions now rank ninth in the state going into District Semifinals next week. They will face John Carroll again on Tuesday, February 12, but this time on their court in Fort Pierce at 5:30 p.m.